I have a confession to make! I was once afraid of the kitchen. I didn’t enjoy any form of cooking or baking, but I’m getting better. For the first round of the Get Your Chef On I watched from the sidelines, while others shared their creations using the special ingredient of lemon. I decided to no longer be a wall flower and I’ve entered the contest. The ingredient this round is coconut! YUM! I’m not quite sure what made me think of macaroons as soon as I heard the ingredient was coconut. I’m guessing it was probably all the Christmas in July talk I keep hear around blogland. Every year for the holidays I make chocolate macaroons for our Christmas Cookie Exchange. 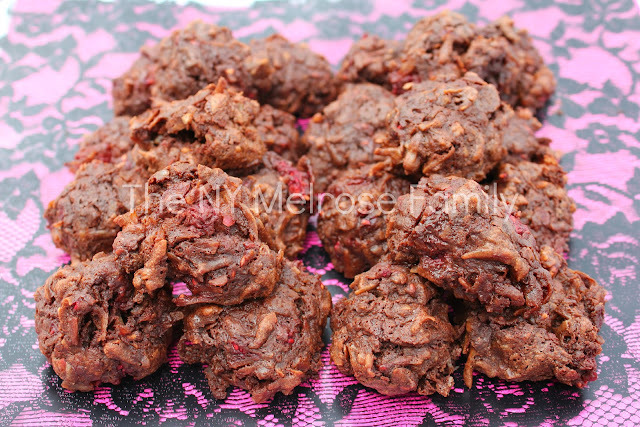 I had to kick it up a notch for this challenge so for a summer twist I give you Chocolate RASPBERRY Macaroons. The inspiration for the combination of chocolate and raspberries comes from my high school days of working at the cutest family owned ice cream parlor. My favorite ice cream treat in between customers was chocolate raspberry ice cream! It just reminds me of those carefree days of Summertime. Whisk together egg whites, cocoa powder, sugar, salt and vanilla extract. Stir in coconut and melted chocolate. Finally, add in raspberries and fold into the mixture. The raspberries will crush as you fold it into the batter. Line baking sheets with wax paper (make sure wax paper doesn’t hang over the cookie sheet or it’ll burn). Place small mounds of batter several inches apart. Bake for 20 minutes at 325 F or until macaroons are shiny. Let stand 10 minutes then remove to a wire rack. It’s a chocolate summertime delight! Oh now I love these, great use of coconut! Those look great! Going to save this recipe & try it myself! oh these look yummy! I love all of the ingredients! How creative! I love the idea of a chocolate macaroon. Must make! Jenny! Oh YUMMY!! These look great- you did an amazing job on these!! Thanks for joining in the #GYCO Challenge- loved your recipe!!!! Ok, seriously, those look AMAZING!! I'm stopping by from the GFC Blog Hop and am now a new follower:) Would love for you to stop by Crazy Mama Drama! Macaroons, raspberries, chocolate? All things I love! Can't wait to try these! 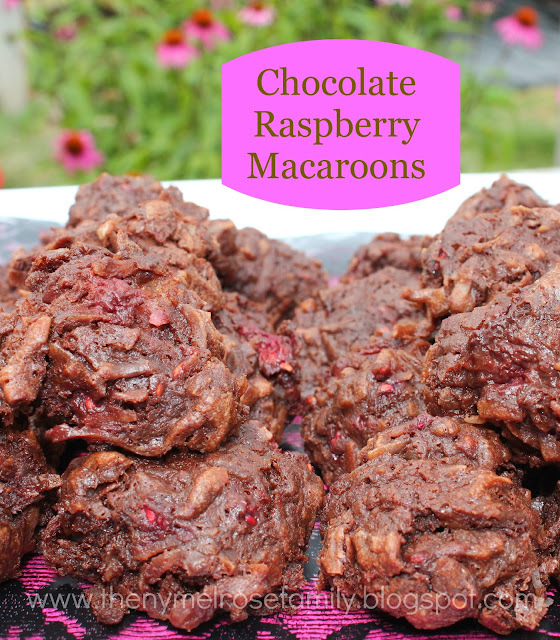 Oh I love macaroons, but to add chocolate and raspberries??? oh my! Chocolate and raspberry – a match made in heaven. These cookies look amazing! I love the combo of chocolate and raspberries. The macaroons look great! Thank you for sharing on Saturday Show and Tell. I hope you'll join us again this week with some more great ideas! I just want to tell you that I am just beginner to blogs and certainly liked this page. Most likely I’m want to bookmark your site . You certainly come with very good article content. Regards for sharing your webpage. These look amazing! I’ll be sharing on Facebook tomorrow 🙂 Thanks for linking up at Mom On Timeout! Those look amazing, Jenny! Thanks for linking up to the Keep Calm and Link Up! Hope to see you back next week!